Every airplane is designed to perform a particular mission. Some are good at carrying cargo, some at crop-dusting, some at comfortable passenger transportation. Air superiority fighters are optimized for speed and maneuverability. Within this elite group of high-performance fighters, the F-14 is the top end of the spectrum. It has the speed, firepower and maneuverability to make it the king of the hill. 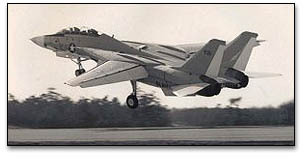 One of my jobs as a Grumman test pilot was to test-fly this remarkable airplane, and over the years I flew most of the F-14s that came down the production line. If a flight happened to be the very first flight on a new aircraft, that added a little extra thrill to the process. An F-14 is a highly complex aircraft, and in spite of the careful attention of the many skilled and dedicated workers who assembled and checked it out, the aircraft is not considered "airworthy" until it has flown. Grumman's former Chief Test Pilot, Chuck Sewell, often said that once you release the brakes, the "b-s" stops. He meant that once the airplane starts rolling down the runway, you're on your own, and it's up to you to test and evaluate the aircraft's performance and to bring it back safely, having gathered enough information to allow the ground crews to fix any problems - and there are always problems, big and small, on a brand new airplane - and prepare the aircraft for its next flight. On March 24th, 1976, I flew the first flight on F-14 #200 with my good friend, the late Roger Ferguson, serving as Weapons System Officer in the rear seat. If any first flight on an F-14 can be said to be perfect, this was it. The day was clear and calm and the airplane performed magnificently, making the flight of #200 that day illustrative of the ideal first flight. During our takeoff roll, my attention was divided between the hydraulic, engine and fuel instruments and keeping the airplane accelerating straight down runway 32 at the Grumman Test Facility located at Calverton, NY. The F-14 accelerates very quickly, and at approximately 90 knots I pulled the control stick back. The nose rose almost instantly to about 10 degrees of pitch, and immediately thereafter we became airborne. The moment of lift-off on a first flight is quite exhilarating. All of your senses are focused on how the airplane is performing; does it "feel" right, are there any traces of smoke, any unexpected vibrations or trim changes, do the engine instruments indicate nominal performance, have any warning lights come on? I've seldom felt more "alive" and intensely focused than at that moment. So far, so good. After takeoff, I retracted the landing gear and flaps. Roger and I then circled the Calverton airport once or twice as I cycled the landing gear up and down three times. If there was going to be any problem getting the gear down again, I wanted to find that out while I still had a full load of fuel, rather than waiting till the end of the flight when - low on fuel - I'd have less time to work through emergency procedures. The gear worked fine, and we started to climb, headed southeast out over the Atlantic. Roger was checking and working the radar to keep us clear of any conflicting air traffic. Once we entered the Warning Area off the south shore of Long Island, we were free of traffic conflicts and could proceed with the rest of our checkouts. First we did some of the more mundane checks, such as maximum control authority rolls, a compass alignment swing, auto-pilot checks, engine shutdowns and re-starts, and Roger's radar system checkouts. All the while, I was observing how the fuel was feeding into the engines, how the trim of the aircraft felt, and how all the sub-systems were performing. Satisfied that the basic systems were assembled solidly, we began to check out the plane's structural integrity by pushing the power up and accelerating to 500 knots at 10,000 feet. At this point I rolled into a 90-degree bank and began to pull the control stick back. I continued to pull until the g-meter registered the maximum allowable 6.5 g's, subjecting us both to 6 1/2 times the force of gravity. This high-speed maneuver, which presses you down in your seat and makes moving and even breathing difficult, was a good check of the structural integrity of the airplane and its supporting sub-systems. Using some of the considerable energy generated during this last high-speed maneuver, I pulled the nose up and began to climb to 35,000 feet. Headed west, generally back towards Calverton, I pushed the power up into full afterburner while noting the time. Number 200 began to accelerate impressively, and soon was supersonic. I allowed the acceleration to continue to approximately twice the speed of sound, all the while paying close attention to fuel transfer and engine performance. Any miss-scheduling of the inlet ramps, fuel control, of afterburner nozzles would likely result in a engine compressor stall, causing a loud, attention-getting boom and abrupt yawing of the whole plane. But everything worked beautifully on #200. We were at mach 2 (approximately 1300 mph) within 90 seconds from the start of the run. Pulling the throttles to idle, I rechecked the engine instruments and then pulled the nose up. Passing through 40,000 feet and climbing at a 30 degree angle, I rolled inverted and pulled the nose down to the horizon. From 40,000 feet you can see all the way to Cape May in New Jersey to the south and back north to the Gloucester Peninsula. It's quite a ride! Gliding back down to 15,000 feet or so, I did a series of acrobatic maneuvers - loops and rolls. The reason was to challenge the aircraft's flight instruments and to make su re the gyros would follow the maneuvers and not "tumble". I then rolled the plane over, flying upside down to check on the cockpit's cleanliness. During the manufacturing process, it's very hard to keep drill shavings and other manufacturing debris out of the airplane, but these potential hazards will float out of their hiding places during inverted flight. Once again, #200 showed itself to be a well-made airplane. We then flew to an area designated 5202 - a restricted area between the "flukes" of Long Island's east end. Roger set up the weapons systems, while I flew the aircraft through a series of mock dive-bombing and strafing runs. We both checked the weapons system for the proper release cues and steering information. As the fuel indicator approached minimum, I headed back to Calverton to do a series of touch-and-go landings. On one of them, I flew down the glide slope just as if I were going to land on an aircraft carrier, allowing the airplane to hit the runway hard. A jolt of that kind on touch-down is another test of structural integrity. When the low fuel lights came on, I make on last landing and taxied #200 back to the flight line where the engineers waited to debrief us. Since F -14 #200 was so well manufactured, there wasn't really much to pass along to the engineers and maintenance personnel for repair. On the average, an F-14's first flight would generate between 10 and 20 discrepancies, but #200 was so clean that we invited its future owner, The US Navy, to fly the next flight. That was good news for Grumman, but I couldn't help wishing I could fly that fine airplane one more time.